Homeowners often think if they own an older home, they are stuck with yesterday’s technology. This is not the case. You may not be building a new home but it doesn’t mean you can’t add some affordable ‘smarts’ to make life a little easier! A midnight dash to the bathroom – the lights turn on. Motion sensors can be used in any area of your home to detect when someone walks into the detection zone and to then turn lighting on. When the zone is no longer occupied, the sensor then turns lights off. Have a look at our Green-i range of sensors for some easy install PIR detectors that can be wired into your existing 230V system by your electrician. Almost every new device for the home comes with an app these days. It’s likely you already have a smart phone or tablet, so using these to control sub-systems via the manufacturer-provided apps can save you heaps, with no need for the expense of touch panels or key pads. Even when installing a house wide system for a customer, we still make use of this type of control, the only difference is that we can link (integrate) the sub-systems together so they can all be controlled from one control screen on your smart device, rather than having to open up multiple apps. This creates a smart home system. A favourite feature of smart home systems is the ability to see what’s happening when you’re away from the home. An advantage of the recent increase in wireless, internet capable surveillance cameras is that they can provide you with this capability for minimal cost. We’ve come across a few battery controlled systems lately that can provide reasonable images viewed via your smartphone, save recordings for a pre-determined period (cloud-based storage), and alert you according to your pre-set requirements if someone enters your property. Designed for the DIY market to operate through a standard domestic type modem, they require very little technical know how to set up, and are priced in the hundreds, rather than thousands of dollars, that historically would have been your outlay. If you require a higher level of security with alarms, cameras etc, please give us a call. Again pricing has reduced drastically, and it is no longer difficult or expensive to fit a security system into an existing residence, with little wiring required. 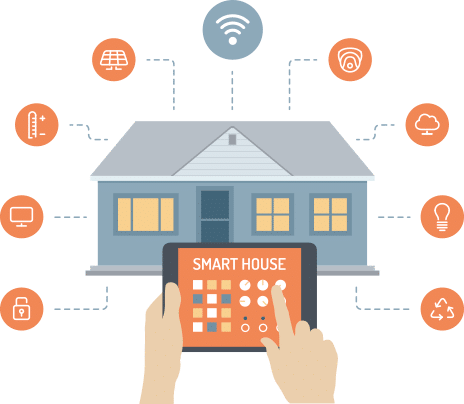 As mentioned above with the proliferation of wireless cameras and other devices, owning an existing home with cabling that is not easily accessible does not necessarily mean that all benefits of a modern smart home can not be made available. If you’re considering ways to turn your existing property into a smart home, do get in touch. There may well be things we can suggest that might meet your needs without breaking your budget! Read more about smart home systems.